Born in Williamston, NC, and educated at East Carolina University, Lela Harrell Chesson, has been a Nash County resident since 1967. She taught English in the Nash-Rocky Mount School System before serving as Community Relations Director and Public Information Officer for 20 years. Her work earned several Blue Ribbons from the National School Public Relations Committee. Mrs. Chesson’s work in planning Public School Forums and preparing the Superintendent’s Annual Report was instrumental in establishing the Nash-Rocky Mount School System. Lela acted on her belief that our schools and our community must work together to make both stronger. She worked closely with the Rocky Mount Area Chamber of Commerce on projects such as the All-American City recognition. Ms. Chesson co-authored ‘A Pictorial History of Rocky Mount’. She was a key participant in founding the Twin County Education Foundation and part of the core group that helped launch the Downeast Partnership for Children. Lela was also an active leader in the school system’s annual United Way Campaign. Following her retirement from the school system, Mrs. Chesson served as Family Editor for the Rocky Mount Telegram. She wrote a number of articles that were published in state-wide newspapers. An active member of Lakeside Baptist Church for 37 years, Lela has served in every aspect of their ministry. In the community, Lela represented youth as a Guardian ad Litem. Lakeside Pastor Jody Wright says of Lela, “her best and most enduring work will, I suspect, prove to be the support, counsel, and advocacy offered to young people and their families struggling with issues related to being gay”. Lela established the first Parents, Family, and Friends of Lesbians and Gays (PFLAG) chapter east of Raleigh. She wrote and had performed “Out in Left Field”, a play on tolerance. Lela and husband Shelton have two of sons: Juan Chesson (deceased) & Harold Chesson and one granddaughter, Catherine Grace Chesson Kuralt. 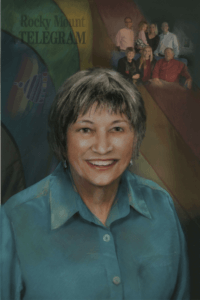 For a lifetime of advocacy and service to others, Twin County Community Pride is pleased to induct Lela Harrell Chesson to the Twin County Hall of Fame.